Fastens with a toggle clasp and features two sturdy carry handles. Can also be used as a stylish tote bag. Shoulder craft bag featuring the charming Cats in Jumpers print. Cream background with multi cat in jumpers print. Brand new, sturdy Everything Mary organizers! Lots of storage spaces and pretty design! 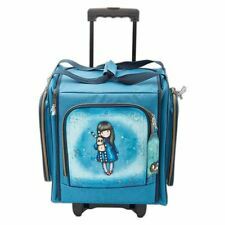 Features magnetic button closure to the inside and two sturdy carry handles. Tote bag features two sturdy carry handles. Hook and Loop. Sewing Patterns. Keep them all together in one place with this handy storage folder, you can even take it with you on the go. This folder will hold panels which are 8.25" x 5.5" (21cm x 14cm). We will always get in touch with you if there is a discrepancy between requested colour/style and availability. Wheelable Craft Tote - Santoro. New and exclusively from Docrafts this beautiful Santoro's Gorjuss Wheelable Craft Tote is perfect for storing and transporting all your crafting essentials. We will always get in touch with you if there is a discrepancy between requested colour/style and availability. Bright, vivid colors define the signature artwork of artist Laurel Burch Her totes are designed to be practical and useful art Use your bag to carry produce from the farmer's market, shopping at your favorite store or taking your latest craft project on any journey This package contains one 14.5x4x10 inch bag Imported. .
Delicate, pretty, bold and goes with everything?. Sounds like this bag was made for you. We took our famous square organizer and made it better, made with durable polyester, now it can fold open to save space on your counters and tables. The tote is also loaded with pockets on the outside including 4 Open Pockets, 1 slash pocket, and one full zip pocket. Santoro Autumn Leaves Mini Craft Tote. It's a perfect partner for the Wheelable Craft Tote. New to Gorjuss, we introduce the Mini Craft Tote. Earthy tones and rich colours are abundant in this collection and make a lovely backdrop for a host of new Gorjuss characters. 5 picture window tote bag. ArtBin-Collapsible Rolling Tote: Gray This tote is perfect for carrying Super Satchel tote boxes (sold separately) This package contains one 15-3/4x14-1/4x12 inch collapsible rolling tote with one retractable handle and one carrying handle Imported. .
faire vite, beaux albums de mémoire! Ce paquet contient un sac fourre-tout en plastique de 1x313 pouces avec sept poches scellées au bas, une pochette pour accessoires de 4.5x4.25 pouces, une fermeture à glissière et une poignée. peut contenir jusqu'à 300 feuilles de papier de 12 x 12 pouces importé. .
un fourre-tout en néoprène robuste avec plusieurs poignées et sangles rend le transport et le stockage de la lueur sécuritaire, confortable, facile et élégant chaque sac est livré avec une fermeture à glissière complète et une poche extérieure convient aux modèles de base et premium lueur ce paquet contient un sac fourre-tout en néoprène de 20 x 15,5 pouces importé. .
Green Tote Bag w/Storage Pockets New NOS. 14-3/4" high, 11-1/4" wide and 4-1/4 thick. 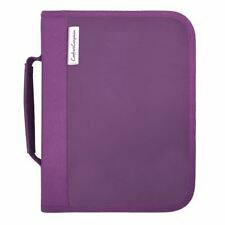 It has I nside pockets & one large outside pocket and a 3-Ring binder with a clear organizer. What you see is what you get, sold as is. COP136383 CREATIVE OPTIONS STORAGE RACK GRAB N GO MD BLU GRY. Model Number: COP136383. Manufacturer Part Number COP136383. Product Model COP136383. Manufacturer: CREATIVE OPTIONS. Manufacturer CREATIVE OPTIONS. On the outside: four open-top pockets, five slash pockets, two hook and loop pockets and one full length zip pocket. Hook and Loop. Pink Star pattern. Includes five different storage areas. Sewing Patterns. The nifty Desktop Organiser by Everything Mary is the perfect storage addition to any personal workspace. To the outside, the organiser includes eight open pockets and one closed-lid velcro pocket. Made from durable microfiber, it includes a handy and sturdy carry handle. Tim Holtz Storage Studios Typography Spinning Craft Tote-7.25"x7.25"x15.75"
Organize your crafts with this handy tote! This soft-sided fabric storage tote is printed with cool vintage designs Tote measures approximately 7.25x15.75x7.25 inches and features durable, reinforced handles, several pockets and an attachable spinning carousel Imported. . Storage Studios-Macbeth Spinning Craft Tote: Pink And Green This spinning craft tote is perfect for storing craft accessories and more! This package contains one 15-3/4x7-1/4x7-1/4 inch spinning craft tote with one attachable spinning carousel, one large middle compartment and several various sized external pockets Imported. .
YAZZII Crafters Companion Bag (Maroon) - NEW. Condition is New. Brand New!! Never used!! Will come as pictured!! Made from touch, padded nylon, this tote can transport and store your paper cutter safely The multiple straps make it easy to carry Features full, two-way zipper closure and an inner pocket to store other supplies This package contains one 17x15.5x4.25 inch tote Imported. .
Santoro Autumn Leaves Wheelable Craft Tote. It's a perfect partner for the Mini Craft Tote. Earthy tones and rich colours are abundant in this collection and make a lovely backdrop for a host of new Gorjuss characters. Nine pockets line the outside of the box, featuring seven open and two Velcro pockets. Everything Mary constructs its products with care and precision. This tote was constructed with our users' needs in mind! Accessories not included. In addition, there is also added elasticized storage for your paintbrushes, pens, pencils (up to 16). It is very lightly used and looks new! Magnetic Catch. Pleated outside pocket, with an interior pocket and a removable cardboard base. Hook and Loop. Sewing Patterns.